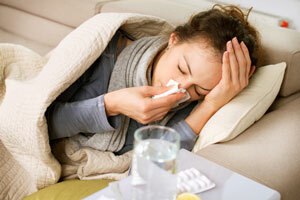 Being a mom is amazing in so many ways...that is, until you get sick. Once I became a mom, I quickly realized that "taking a sick day" was a thing of the past. We women are such an integral part of our family's day-to-day routine that the gears literally grind to a screeching halt if we happen to be out of commission. That's why when the sniffles or the full-blown flu take hold, I lean on the remedy I truly trust to keep me going and relieve all my symptoms: Vicks DayQuil and NyQuil. I first became acquainted with Vicks as a child. Every time I would get sick, my mom would whip out the large canister of Vicks VapoRub from the medicine cabinet and slather it all over my chest before I went to sleep. I can still remember waking up feeling better than I did the night before, thanks to this product. When I became a Science teacher, I found that being in the midst of 150 students each and every day made me a walking germ magnet. I was always sick it seemed, though I didn't have the luxury of calling in sick whenever I was under the weather. That's when I learned to depend on Vicks DayQuil and NyQuil to get me through those tough times. 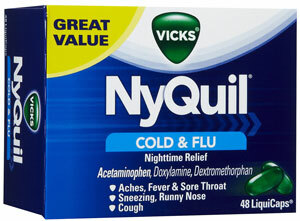 When I would get home from a hard day's work, I would always make sure to take Vicks NyQuil before going to bed. Sleep is an important part of a recovery from a cold or flu, but it’s not always easy to get the rest you need when you are sick. Vicks NyQuil Cold & Flu Relief helps relieve symptoms of a cough, cold or flu so you can get the sleep you need so you don’t lose a moment. Now that I'm a mom with absolutely no chance of taking a sick day, I rely heavily on Vicks DayQuil and NyQuil to keep me going and quickly get me back on feet again. I honestly can't remember the last time that I was under the weather and didn't run straight to these two medicines for help. In my opinion, there's no better products on the market than this daytime/nighttime combo from Vicks. When using DayQuil/NyQuil, be sure to follow the usage guidelines for warnings and dosage directions or visit http://www.vicks.com for more information. 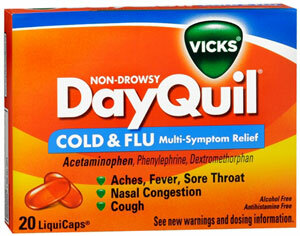 Disclosure: I participated in a campaign on behalf of Mom Central Consulting for Vicks DayQuil & NyQuil. 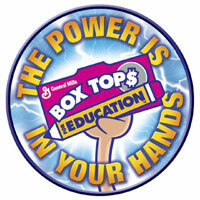 I received product samples and a promotional item as a thank you for participating.